Labour leadership hopeful Angela Eagle hasn’t even started campaigning yet, and already there are huge question marks hanging over her bid to oust Jeremy Corbyn. 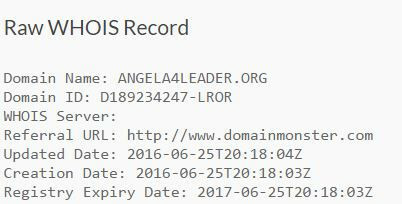 Website registration data appears to show that the domain earmarked for her leadership campaign website ‘angela4leader.org’ was registered two days before Ms Eagle resigned. The website was registered at 6pm on Saturday 25 June, according to its publicly available “whois” information – several hours before Hilary Benn was sacked by the Labour leader. Joe McCrea, the man who registered the domain, is a PR executive who served as a special adviser in Downing Street during Tony Blair’s time as Prime Minister. Angela Eagle resigned, citing Hilary Benn’s dismissal. However, this domain, set up by Tony Blair’s former PR guy, was registered before Ms Eagle resigned. This information clearly shows that the Labour coup was pre-planned and that Angela Eagle was already being lined up as a potential successor. A spokesman for Eagle told Buzzfeed that she does know Mr McCrea personally, but did not authorise the purchase and was unaware of its existence.